Contrary to the belief of most employers (and many employment lawyers) there is no provision in the Employment Standards Act, 2000, S.O. 2000, c. 41 (the “Employment Standards Act”) which allows employers to terminate an employee for “just cause” without providing them with advance notice of termination or pay instead of notice. The Employment Standards Act specifically provides that every employee is entitled to notice of termination (or termination pay as defined by the Employment Standards Act), and severance pay (if applicable as defined by the Employment Standards Act) unless a specific provision of the Employment Standards Act (and its regulations) exempts the employer from providing notice of termination or termination pay (and severance pay if applicable). Most of the exemptions to providing notice of termination or termination pay are found in Regulation 288/01 made under the Employment Standard Act. If you search the Employment Standards Act and its regulations for the term “just cause” you will not find it. That is because the Employment Standards Act does not permit an employer to terminate an employee without prior notice or the provision of termination pay for “just cause”. Guilty of wilful misconduct, disobedience or wilful neglect of duty that is not trivial and has not been condoned by the employer. This is not the same thing as “just cause”. Just cause is a common law term. In theory, an employer might have grounds to terminate an employee with “just cause” for poor performance. Not so under the Employment Standards Act. Prior to summarily terminating an employee without any compensation, an employer must assess whether the employee was essentially “being bad on purpose”. That is the law as set out in the Employment Standards Act. Most employers (and many employment lawyers), do not consider this – but simply engage in the common law, more objective “just cause” analysis. The effect on employees is not insignificant. The Employment Standards Act sets a floor of minimal entitlements that employees are entitled to and cannot contract out of. 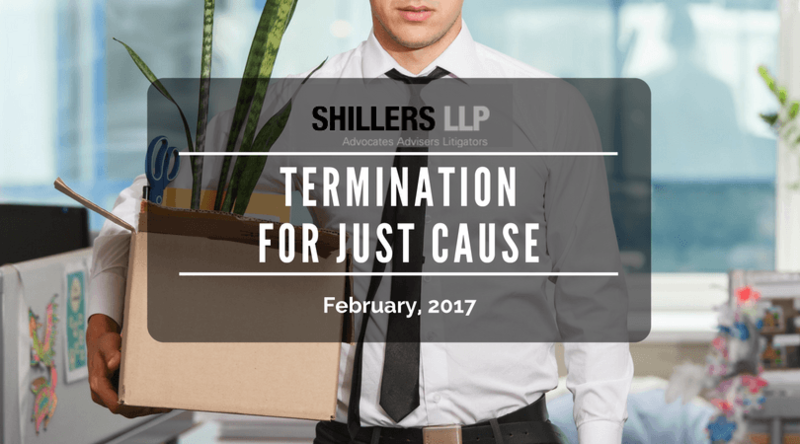 Employees should not be deprived of the minimal amount of notice of termination (or termination pay, and severance pay if applicable) unless the employer can demonstrate that the employee essentially knew that their conduct would lead to summary dismissal. An employer who does not engage in this analysis is opening themselves up to a claim that they breached the Employment Standards Act, which is an independent actionable wrong, and could lead to an award of punitive damages. If your employment has been terminated with or without compensation, or you feel you have been subject to a wrongful dismissal, contact us immediately for a free consultation.